Creative Uses of NFI Guides Never Stop! "It's like a focus group [guide] for dummies!" That's the conclusion William (Bill) Macchione came to after he used National Fatherhood Initiative's 14 Critical Issues to Discuss with Moms guide to help him create questions for a focus group he conducted with single moms. Conducts outreach to increase referrals of dads to direct-service providers. Writes grants to fund the work of direct-service providers. Initiates relationships and establishes connections that bring added social capital and other resources to providers' work with dads. He has, for example, created connections between providers and Community Legal Aid to help dads with legal issues that are beyond practitioners' expertise. I had the pleasure of interviewing him about his efforts in Summit County and his use of this incredibly flexible, useful guide. In doing so, I learned so much more about Bill's effort to spread fatherhood work far and wide in Summit County and how the guide fits into that work. ​After getting his feet wet with a focus in Akron, the county seat, Bill has targeted four communities, one in each of the four corners of the county, to plant the seed for fatherhood programs. He has used a specific tactic in each county. He first approached the superintendent of schools because of the central role schools play in every community. He explained that superintendents tend to be very well connected to other leaders in the community. They also tend to be in touch daily with the effects of father absence on children, families, and their community. He worked with each superintendent to bring other leaders and direct-service providers together to form a committee to plan exactly how each community would get fatherhood programs in place. ​In addition to approaching school superintendents, Bill also approached two other entities in each community--the local housing authority and Head Start program--because of their connection to so many of the families affected by father absence. And herein lies the role of the 14 Critical Issues guide in his work. ​When Bill started to work with the housing authority in Twinsburg, a town of around 20,000 in northeast Ohio 25 miles southeast of Cleveland, he learned that women--many of them single moms--made up nearly all of the residents in the complex run by the authority. Given that this gender dynamic was unusual among the housing authority complexes he'd encountered, he realized he'd have to engage the moms to engage the dads. He ordered the 14 Critical Issues guide to help him and a local fatherhood practitioner develop questions for a focus group they conducted with moms to identify ways they could encourage the moms to get dads more involved in their children's lives. More specifically, they also wanted to engage the moms--to show they cared about the moms and their children--so the moms would serve as a recruitment channel for getting dads into a fatherhood program. Sure enough, this tactic worked. They had a great discussion that helped the moms see the importance of involving dads and address some of the difficult feelings they had about the dads of their children. Some of the moms recruited their children's dads into a 6-week fatherhood program. Ironically, I've often told staff at NFI that to fulfill our mission we must get as many of our resources into as many hands as possible. Now I realize we also need to do everything we can to "activate" those hands. Customize a discussion with moms using the guide in any way you want. Use it to design lectures, workshops, seminars, events, and other activities (even focus groups) for moms. Use it to supplement NFI's Understanding Dad™ program for moms and any parenting program for moms. Share it with staff at any level who engage moms at any level (one-on-one or in groups) to build their knowledge about the importance of dads to child well-being and encourage moms to create pathways for father involvement. All of us at NFI look forward to partnering with you to encourage moms to involve dads using this flexible guide and our other resources for moms. 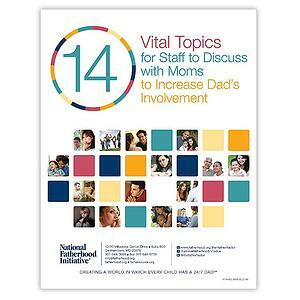 Have you acquired the 14 Critical Issues to Discuss with Moms guide? If so, have you used it?